4 nights in mountain gites – accommodation will be dormitories with the exception of one gite where we will endeavour to get twin-share rooms depending on availability. 13 breakfasts and 5 dinners. Your luggage transported each day by vehicle except on Mafate and the Piton des Neiges ascent. Vehicle support in case of injury, illness, etc. Road transfers by private vehicle. Single, timed, group airport transfers on arrival and departure. A free Mountain Kingdoms Water-to-Go bottle or a free Mountain Kingdoms fleece. A superb tropical trek on this small but delightful French volcanic island in the middle of the Indian Ocean. 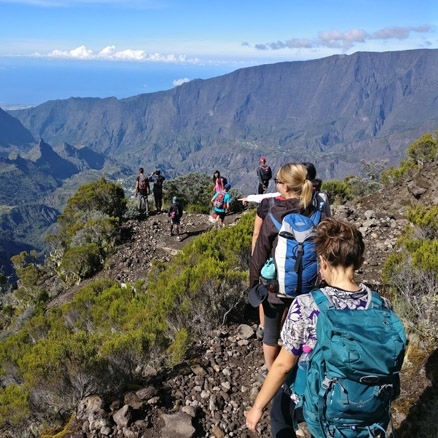 Reunion Island is undoubtedly a hiker’s paradise. This little-known French territory is the perfect destination for adventurous trekkers thanks to its rugged topography and unspoilt volcanic landscape. The island is ringed by sandy beaches whilst the interior is filled with waterfalls and dense tropical rainforest. Over a third of Reunion has been designated a UNESCO world heritage site and remains pristine. The island itself was created roughly 3 million years ago when the Piton des Neiges burst out of the Indian Ocean. This now inactive volcano collapsed to form three awe-inspiring cirques, one of which is only accessible by foot or helicopter. Whilst the inactive remains of the Piton des Neiges make up the northern and western half of the island, the southern and eastern half is comprised of one of the world’s most active volcanoes – the mighty Piton de la Fournaise, whose lava sometimes runs all the way into the sea. It’s not just the scenery which is diverse on Reunion, it is also a melting-pot of cultures. As its name suggests, the island literally unites a number of different ethnic groups. This merging of cultures has created Reunion’s distinctive creole culture with its own language, music, architecture and delicious cuisine. This holiday has been carefully designed to ensure you do not miss any of the must-sees highlights of Reunion. The three cirques each have their own individual character. Waking up before dawn to trek to the summit of Piton des Neiges for a 360 degree sunrise over the entire island is truly unforgettable, whilst Piton de la Fournaise offers an entirely different view down into the smoking crater at its heart. Beyond the superb volcano trekking there is time to absorb the creole culture and relax on a palm-fringed beach. Meal arrangements: 13 breakfasts and 5 dinners. Fly London to Roland Garros airport, Reunion. Group transfer to Saint Gilles les Bains. Traverse the Mafate cirque staying in Mountain Gites. Cross into the Cilaos cirque and hike the iconic ‘La Chapelle’. Ascend and descend the Piton des Neiges. Transfer to the Salazie cirque. Rest day in Hell Bourg and Trou de Fer hike. Cultural exploration of the Wild South, via minibus. Ascent of the Piton de la Fournaise. Descend to Langevin valley. Transfer to Saint Gilles les Bains. Relaxation beach day and transfer to Saint Denis. Our Reunion Island holiday is led by professional French guides who speak excellent English and are very knowledgeable out the history, flora and fauna of the Island. Depart the UK on your overnight flight to Reunion. Day 2 - Arrive Roland Garros Airport. Transfer to hotel. On arrival at the airport there will be a single group transfer to Saint Gilles les Bains. En route, look out for your first glimpse of a paille-en-queue, or white-tailed tropic bird. This large white seabird, with a long white tail is an emblem of the Indian Ocean. Saint Gilles is famous for its pristine white sand beaches and spectacular coral reef. Although sharks are found all around Reunion, the beaches in this area are protected by a lagoon. Day 3 - Trek from Maido to Roche Plate - 1,200m descent, 3-4 hours. Today you will meet your trek guide who will give you a briefing before your adventure begins. You then head directly to the most famous viewpoint on the island, Maido. Maido sits at the top of the Mafate cirque, and gives you the first of many breath-taking views into the mountains. If you're in luck, you will get a clear view of the Piton des Neiges and from here you can also spy many of the small creole hamlets that sit isolated from the rest of the island amongst jagged hills and rivers. You will trek down into the cirque to Roche Plate. The path is steep at times but gives you a magnificent view of Mafate and its many carved peaks. Utterly remote, it is the only cirque on the island that can only be reached by helicopter or foot. Mafate was initially a place of refuge for escaped slaves during colonial times, and many of the people living there now are descendants of these brave fugitives. You may catch a glimpse of your first 'bibe', a large orange and black (and harmless) spider which builds its huge webs in the vegetation, as well as several of the island's endemic bird species. Upon reaching Roche Plate, you will amble past banana trees and creole houses to reach your gite for the night. You have some time to relax in the afternoon and soak up the silence of this remote spot. In the evening you will be treated to your first creole meal, most likely a combination of a cari/curry, graines/beans and lentils, rice, and piment/chilli. Rum arrangé is almost bound to make an appearance too, such is its importance in creole life! There are many flavours of this infused rum to try, including vanilla, pineapple, and wild fern. Day 4 - Trek from Roche Plate to Marla - 640m ascent, 500m descent, 6-7½ hours. After a typical gite breakfast, most likely baguette, butter, jam and coffee/tea, you will begin your traverse of the southern half of Mafate. Panoramic views open themselves up to you as you journey through the cirque, feeling very much as if you're in an enormous crater. After a considerable ascent you arrive at Les Trois Roches, arguably one of the most spectacular sights in Reunion. You will picnic on this rocky plateau, which drops suddenly away to reveal an enormous waterfall that cascades into a gorge, often displaying a rainbow as the sun peeks down into the crevasse. From here the trek continues to Marla, Mafate's most southern village and where you will be spend the night. Behind Marla you will see the cirque edge that you will ascend tomorrow, topped by Les Trois Salazes, three remarkable pinnacles of rock that protrude from the top of the ridge. To their left the 'dog's head' is visible - you'll see! In Marla you will find a snack, a bar/café typical of the island which sells snacks and dodos¸ the island's much loved beer. You may like to explore in the afternoon. There is a pleasant walk to Plateau de Kerval, a beautiful spot with a lake and a view of the Piton des Neiges, which takes you past the school and church. If not, you can simply relax in the afternoon. Deer can sometimes be spotted in this area; these are not found anywhere else on the island and are a non-native species. Day 5 - Trek from Marla to Cilaos - 1,250m ascent, 820m descent, 6-7 hours. You start your day with a steep but fairly short ascent to leave Mafate and enter the cirque of Cilaos. We do this via the Col du Taibit pass, one of the few entrances into Mafate. The path zigs and zags up the side of the cirque, giving you a lovely view of Marla - see if you can spot your gite! Once at the top of the pass you may well spot a tec-tec, a small black, brown and white endemic bird that seems to enjoy watching hikers on the trail. You then descend the other side of the cirque edge, winding through forest to eventually catch your first glimpse of Cilaos. Around halfway down you come upon Ilet des Salazes, a small community hut which, when open, serves coffee and cake in the middle of the forest. This is a charming little spot and a good place to have a rest with the locals. It is another hour of walking from here until you reach the road where you continue your trek until you reach the main town via an old pathway. For the next two nights you will stay in Le Vieux Cep (The Old Vine), a thoroughly charming 3* hotel that is full of character and comfort. With rooms and a swimming pool that have gorgeous views of the Piton des Neiges, this is the ideal spot for you to rest up after your first few days of trekking. Cilaos itself is home to several nice restaurants, a lake with hireable pedalos, museums, and a beautiful church, and is a stunning mountain town. Day 6 - Day walk, La Chapelle - 800m ascent and descent, 5-6 hours. You are in for a real treat today. La Chapelle is an enthralling hike, and arguably one of the most popular and well-known on the island. You set off on foot from your hotel, and begin with a steep descent through a forest. You will cross several little clear-water streams, and follow a path that skirts around a hill, giving you magnificent views of the side of the cirque that you descended the previous day. Cilaos is home to plenty of interesting plant life, including the beautiful, if invasive, wild ginger that grows abundantly everywhere and bears an unusual orange fruit. There are also succulents everywhere, some reaching human height. Eventually you will reach the river bed that leads to La Chapelle. When Mountain Kingdoms recced this trip we hadn't realised that the hike didn't lead to an actual chapel, but instead to a staggeringly tall gorge which, when the sunlight shines above and through it, resembles a small church. Looking up this black and white striped rock formation really does take your breath away, particularly with the boulder has become stuck in the gorge above. Thousands of birds abide here, and seeing them fly about in the shafts of light is magical. If river-height permits, you can walk right into the gorge, under the boulder, and discover the waterfall at the end of the rock formation. You return to Cilaos via the same path, and have the afternoon at leisure. There is plenty to see in this town, including an embroidery museum and thermal baths. Day 7 - Begin ascending the Piton des Neiges - 1,100m ascent. 3-4 hours. And so it begins, the start of your ascent of the Piton des Neiges, perhaps the toughest but most impressive hike of the holiday. After a relaxed breakfast and lunch in Cilaos, you transfer to Le Bloc, the starting point for the trek. From here it is all up for about four hours as you zig and zag up the cirque wall. If the weather is on your side you will be rewarded with a superb view of Cilaos with a distant glimpse of the sea behind from various different viewpoints as you ascend. However if the cloud has descended, a common occurrence on Reunion in the afternoons, you will be walking through an atmospheric, misty, and densely green forest. Although sustained, once into a rhythm this is a nice steady ascent. That's not to say you won't be relieved to find your gite not far from the summit! The gite du Caverne Dufour is the only gite that serves the Piton des Neiges and although certainly not a luxurious gite it has comfortable dorm beds, a pleasant dining room and beautiful views from the outside terrace. After dinner you retire early in preparation for your pre-dawn start tomorrow. Day 8 - Summit the Piton des Neiges and descend to Plaine des Cafres – 600m ascent, 1,540m descent, 8-9 hours. Transfer to Hell Bourg, Salazie Cirque. It may feel painful at the time, but we can guarantee you won't regret getting up before dawn to walk to the top of the Piton des Neiges. The path leaves from right beside the gite, and geared up in your layers and wearing your head torch, you follow the white marks on rocks (and your guide!) that illuminate your final ascent. Head torch lights bob their way up the volcanic landscape as the sun begins to rise, scoring an orange line on the starry horizon. After around two hours of non-stop ascent you reach, probably with some relief, the summit at 3,070m. Nothing can prepare you for the view that awaits you here. From the top of this dormant volcano you are granted a view of all three cirques, enormous expanses of the Indian Ocean, and even your first glimpse of the Piton de la Fournaise. Watching the sun come up from the crown of the Indian Ocean is an unforgettable experience. Once you've drunk in all you can of the 360 degree views, it's time to leave the summit behind and descend back down to reality. We head down to the gite and have breakfast there before following a different path to the Plaine des Cafres, a flat expanse of land spread between the Piton des Neiges and the Piton de la Fournaise. Cattle are reared here, it being one of the cooler and flatter parts of the island. The path will be muddy in places, but not too steep. You are picked up by minibus after around eight hours of hiking, and driven an hour and a half to your final cirque. The following three nights will be spent in Hell Bourg in the cirque of Salazie, the first overseas village to be granted the 'Most Beautiful Village in France' award. Indeed, it is exceptionally charming, creole houses surrounded by luscious vegetation and pretty waterfalls. Day 9 - Rest day Hell Bourg. A well-deserved rest day after the mammoth task of ascending and descending the Piton des Neiges. You can spend your time simply relaxing in your accommodation, or exploring the village. There are a number of tourist shops, and several bakeries. Maison Folio is an old creole house that is still run by Madame Folio, which houses a number of interesting historical artefacts from the island, giving you an inkling of how life used to be here day-to-day. But even more stunning is its botanical garden, which really does make you feel as if you've walked into a film set with towering fern trees, masses of orchids and even a carnivorous plants section. There is also a musical instruments museum, and you can take a 15 minute stroll down to the now out-of-use thermal baths, the village's old epicentre and now surrounded by a well-kept garden with benches to read on. Day 10 - Trou de Fer day walk, 700m ascent, 700m descent, 6-7 hours. Yet another iconic hike makes up today's venture. Setting off on foot from the village, we walk past enormous thickets of giant bamboo and walls of chou chou to ascend the cirque wall, with lovely views of Hell Bourg below. This is a fairly steep ascent, and will take around two to three hours. The path eventually leads into the Forest of Belouve and Bebour, a tropical rainforest that is well loved by the people of the island. Its twisting trunks and towering fern trees are a delight to walk through. The path is frequently constructed of wooden boards covered with mesh wire to make it less slippery, as this is one of the wetter parts of the island. If you're lucky you may spot a tangue/tenrec, a sort of furry hedgehog that has made its way across from Madagascar and is now a local delicacy. After crossing through the forest you will reach the viewpoint over the Trou de Fer or 'Iron Hole'. The actual waterfalls are inaccessible unless you are a canyoner, but you can admire the spectacle from afar. The 300m gorge was only explored for the first time in 1989, and the waterfalls seemingly drop to nowhere. You picnic on the viewing platform here and return to Hell Bourg via the same path. Day 11 - Exploration of the Sud Sauvage or ‘Wild South’. Today you will explore the south coast of the island. This part of the island is a lot less built up as the Reunion's active volcano looms above, making various areas inhabitable. The south makes for a great road trip, with lots of hidden gems just waiting to be viewed en route. First you visit Le Colosse in Saint Andre, one of the biggest Hindu temples of the island and an impressive sight. From here you continue south past fields of sugar cane and vanilla plantations until you reach the Notre Dame des Laves in Sainte Rose. This church is unlike any other church in the world, as it has survived a lava flow. The church is still surrounded by hardened lava today; at the time of the eruption, the lava flowed right the way to the altar before stopping. Although there may be a scientific explanation for this 'miracle', it is still an interesting site to see. Shortly after Sainte Rose you will stop to visit Anse des Cascades, a spectacular site by the sea with several waterfalls that cascade down the cliffs. There is an optional short walk here via the coast. And now for one of Reunion's real showpieces - Le Grand Brûlé. The volcanic plains creep up on you; one minute you are driving through dense greenery, the next you are cruising over blackened lava. In 2007 the Piton de la Fournaise erupted in a spectacular manner, with the lava flowing all the way down to the sea, creating huge pillars of smoke. The road could only be rebuilt after a considerable amount of time, due to the fact that this new land needed to cool down! It is this road that you take, and there is an opportunity to stop at the viewing point to get a closer glimpse of the lava and admire the Indian Ocean stretching away into the distance. Time permitting, you may also stop in Saint Philippe. This lovely little town showcases plenty of colourful creole houses and several nice restaurants. It is also home to some excellent botanical gardens, which, if there is time, you may be able to visit in the afternoon. Please note that entry to the gardens is not included. From Saint Philippe it is an hour's drive to Saint Pierre, where you will spend your night in a comfortable hotel. Dubbed 'the capital of the South', Saint Pierre is a vibrant city with a lagoon-protected beach, colonial town hall, and plenty of places to shop and to eat out. You will enjoy getting to know this dynamic city for a night - it has a much more creole feel to it than the real capital of Saint Denis. Day 12 - Ascent of the Piton de la Fournaise, 500m ascent, 500m descent, 6-7 hours. In the morning you drive to the Piton de la Fournaise. The road takes you through Le Tampon (which also means buffer in French, and this town is the buffer between the Plaine des Cafres and Saint Pierre - always a laughing point for tourists!). Upon reaching the Plaine des Cafres you head right and begin the ascent up the Route du Volcan. On a clear day you will enjoy breath-taking views of the Piton des Neiges, and both sides of the island. After half an hour or so you turn a corner and are met with the Plaine des Sables and the moon-like landscape of the volcano. You descend on hairpin bends until you are on the plain, and off-road, all part of the adventure. The track is expected to be tarmacked by 2021, much to the locals' dismay. The hike today is completely different from those you have already experienced on Reunion, as you ascend the island's active volcano. Fear not - La Fournaise is a shield volcano that does not erupt explosively. When it does erupt, it forms small lava fountains which conclude in lava flows. If by chance it is erupting when you are there you will not be allowed in the enclosure, but may be able to hike to a viewing point to admire the spectacle. Assuming the volcano is behaving, you will hike to the top of the Dolomieu crater. You begin by a short descent to enter the enclosure, with the seemingly tiny red Formica Leo crater at your feet. You have the opportunity to walk on this crater (which is in fact very large), and you then cross the frozen lava, following white dots that lead you across the flatter part of the walk. You will pass the Chapelle de Rosemont, a hollow lava formation that towers over human height and remains from past eruptions. Shortly after you begin the serious ascent of the volcano, going up and then skirting around the side of the volcano until eventually you are facing east. On the way you will see a crazy twisted landscape, with all kinds of lava formations laying themselves literally at your feet. Once at the top you can peer down into the smoking crater, and in good weather see the Le Grand Brûlé that stretches right down to the Indian Ocean. Be warned that the winds can sometimes be glacial at the top, as you are at 2,522m, so bring warm layers. We descend by the same path. On a clear day the views on the way back are across to the Piton des Neiges and countless old craters of La Fournaise. Tonight you stay at the Gite du Volcan, a simple but pleasant gite with dormitory accommodation. Day 13 - Hike from the Plaine des Sables to Grand Galet - 1,850m descent, 5-6 hours. One final hike to conclude your trip. Today's venture takes you from the Plaine des Sables down to the Langevin valley, via a big descent. This is one of the lesser known hikes on the island, but one of our favourites. The trail is likely to be very quiet and takes you through a variety of different landscapes - from a volcanic mini-cirque and through several different types of forest until eventually you reach Cap Blanc. From the viewing point here you can see an enormous waterfall tumbling into a turquoise pool. People sometimes fish for trout here. Around an hour and a half later, after walking through banana plantations and scrambling over a dry river bed, you will reach the village of Grand Galet. This remote place lies at the top of the Langevin valley. Lying next to Saint Joseph, Langevin is a favourite spot for locals and tourists alike, as the river flows through a series of dozens of waterfalls, little and large. In particular the Reunionaise like to come here to have their Sunday picnics, an integral part of the culture here. It is exactly what it sounds like - on Sundays, huge numbers of Reunionaise families gather at the various gazebos placed around the islands, or at the beaches, to enjoy a picnic together. However there are no sausage rolls or boiled eggs here - the locals bring caris cooked in huge marmites (aluminium cooking pots), tables, chairs, bunting, games, baby cots, and all other things imaginable to have a party at the end of each week. After walking through the village, you will see Grand Galet, one of Reunion's most spectacular waterfalls. You can then explore some of the other waterfalls of the valley should you wish, since they are all close to one another. After your long descent from the volcano you may even wish to take a dip in the cold water. A short minibus transfer takes you to Le Nautile in Saint Gilles les Bains. You have come full circle, and will no doubt feel nostalgic about all the different landscapes and natural phenomena that you have explored in such a short space of time. Such is the nature of Reunion. Day 14 - Day of leisure at the beach. Optional activities. A day of relaxation after nearly two weeks on l'île intense (the intense island), as Reunion is called by all those who experience it. And the reason for this will be clear to you by now! There are a number of optional activities available in and around Saint Gilles. Transparent kayaking and paddle-boarding are both popular activities at La Saline les Bains, the closest beach to your hotel. If you want to really blow your mind one last time, the hotel offers a deal on helicopter rides. With much of the island being inaccessible, this is one of the best ways to see both everything that you have explored from a bird's eye view. Trou de Fer is particularly spectacular from above. Depending on the season you may also be able to go on a humpback whale watching tour. These enormous crustaceans come to Reunion to breed from June - October, and seeing them breach out of the water is truly unforgettable. You may like to enjoy a final creole curry for dinner in one of the many beach-side restaurants at L'Ermitage. Day 15 - Transfer to airport. Fly to UK. That's it - it's over! This morning you will be transferred to Saint Denis airport to catch your flight home. Before Reunion I had no idea that you could get an adrenaline rush just from walking up a hill – it’s safe to say that the island made me fall in love with hiking! It is truly an adventure island, and I will treasure the memories I made there for the rest of my life. There were times when the views were so awe-inspiring that I had goose bumps and my eyes filled with tears – dramatic I know, but such is the nature of the landscapes there. The trekking was at times hard, but you know that you will always be rewarded with a phenomenal feat of nature at the end. Go and discover the intense island – now!